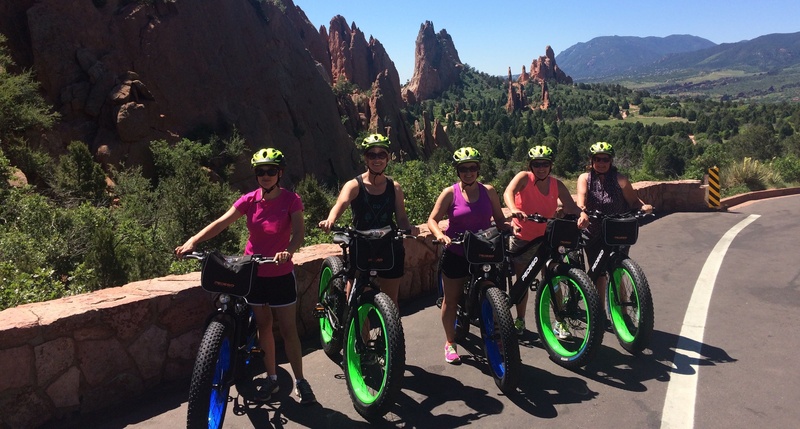 Our awesome Garden of the Gods tours are appropriate for riders ages 14 and up who can demonstrate they can confidently ride a bicycle (younger riders may be able to ride as passengers - please call.) Riders must be 250 pounds or less, and must wear fully closed shoes (no sandals, flip-flops, clogs, or anything with straps, or openings). If you have any questions on these requirements, please call our office at 719.590.6500. Helmets and water are provided for all riders. For those with a stronger taste for adventure, this is our most extensive and interactive tour. 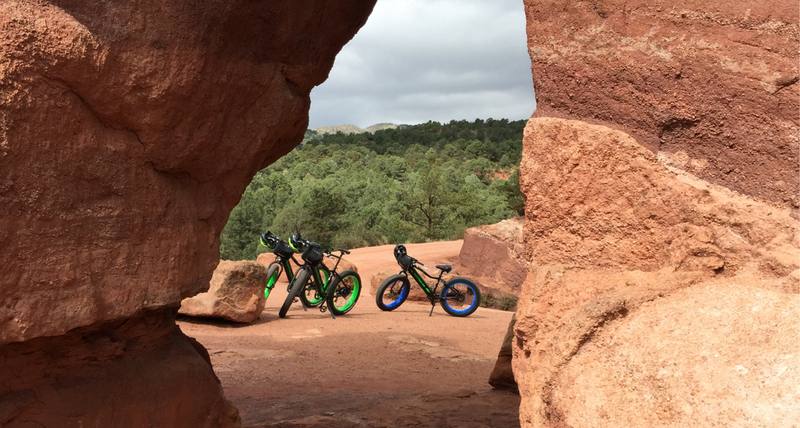 It includes the use of our premium upgraded fat tire bikes (yes they're electric! ), and we will travel at a faster (moderate) pace. As a bonus, it includes a couple short off-road sections, and fun paved trails! You will enjoy all that our full Sightseeing Tour has to offer, plus two additional sections that provide more intimate access to sections and views of the park that most visitors never see or experience! NOTE: Availability is limited, and this tour is designed for intermediate riders. 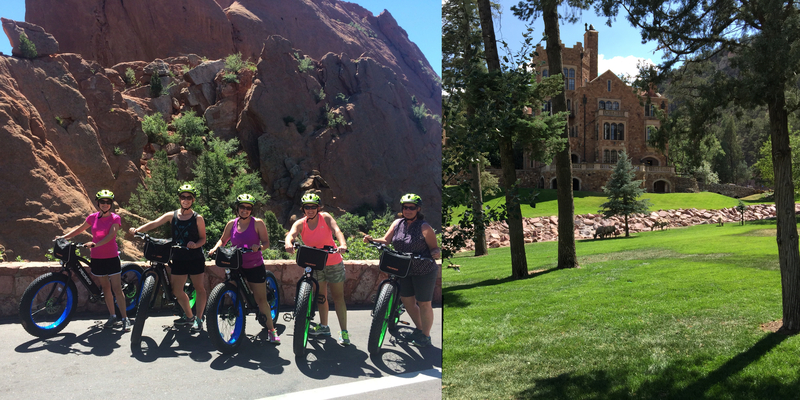 Don't miss one of the best kept secrets of the area, by enjoying an electric bike tour of neighboring Glen Eyrie historic estate along with your tour of the Central Garden of the Gods. This tour gives you wonderful awe inspiring views of both Garden of the Gods, and the neighboring Glen Eyrie valley, home to the castle built by the founder of Colorado Springs. Lots of opportunities for pictures of towering rock formations, and you'll maybe even get to see some big horn sheep or other fun wildlife as we venture into the majestic Glen Eyrie estate. E-Bikes make the ride both easy and fun! Ride a full loop of the Garden, and see many of the key features and vistas. Our Sightseeing Tour takes a leisurely to modest pace through all the paved roads of the park, and gives you a wonderful chance to experience Garden of the Gods in a whole new way! Plenty of stops for pictures, and hear some folklore and history about this one-of-a-kind marvel! E-Bikes make the ride both easy and fun!